This entry was posted in UA and tagged блог on July 7, 2010 by FEMEN. Олександра Шевченко: Янукович “має” Конституцію за повію. This entry was posted in UA and tagged блог on June 29, 2010 by FEMEN. 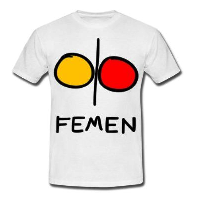 This entry was posted in UA and tagged блог on June 23, 2010 by FEMEN. Такою і повинна бути юнка. Все інше – куски м'яса. This entry was posted in UA and tagged блог on June 21, 2010 by FEMEN.